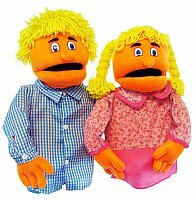 Our colorful sparkle family puppets can expand your cast of puppets at an economy price. They are well-constructed with a foam base and velour tricot skin, and come with removable outfits. Acrylic arm rods with velcro attachments are included.